Furnished apartments at Siegel Suites are the perfect short-term apartment choice. All our affordable, fully furnished apartments are available in great locations throughout the Southwest – all with great low rents. You can rent a nicely furnished studio apartment, furnished one-bedroom apartment, or furnished two-bedroom apartment today with no long term lease and bad credit ok. Apartment living rooms are furnished with sofas, tables, lamps, TVs, and air conditioners. Kitchens have tables, chairs, full-sized refrigerators, and stoves/ovens. Bedrooms are furnished with beds (frame, box spring, mattress, mattress cover), nightstands, lamps, and dressers. Plus, all Siegel Suites apartments come with free cable TV, free utilities, laundry facilities, and other extras. 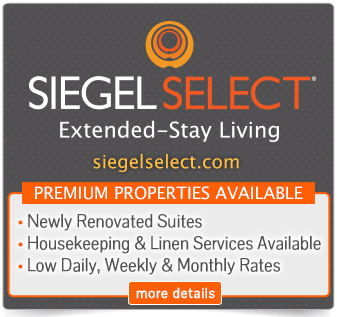 Call us at 1-888-328-0192 to rent your furnished apartment at Siegel Suites today!